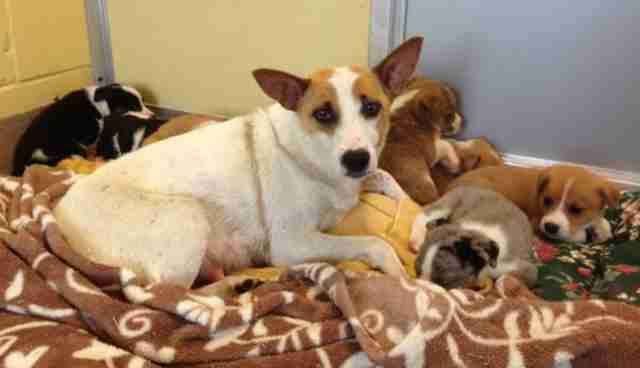 Thanks to the collaboration of residents and police in one New Jersey town, an abandoned Jack Russell terrier and her nine newborn puppies have been reunited after a harrowing separation. After spotting two puppies and a nursing dog walking perilously close to the road, a Toms River woman and her daughter stopped to rescue the family, getting hold of the puppies but failing to grab their mother before she fled to the woods. From that moment, a search began and local law enforcement got involved -- but they didn't know that they would find more than just the single dog. 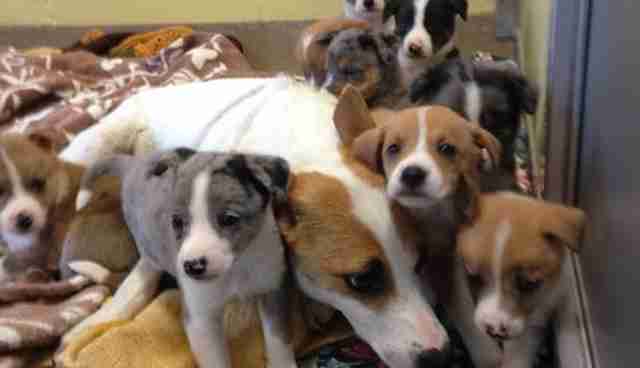 While police roamed the woods in search of the canine mother, officers came across a makeshift dirt den housing seven other puppies from the litter, but no mom. They set out a humane trap, and just five hours later, they were able to rescue the Jack Russell as well. All of the dogs received veterinary treatment after they were reunited -- but not before officers could get a family photo. Photos by Toms River Police Department.